NeuroPT is a physical therapist-owned clinic in Falls Church, Virginia, specializing in physical therapy and wellness for people with neurological disorders. Our clinic is unique because our patients receive personalized, one-on-one care from therapists who are Board Certified Neurological Clinical Specialists. At NeuroPT, you get evaluated and receive treatment based on the latest evidence-based rehabilitation practices in the scientific world. Evolution Pilates is a physical therapist owned and operated clinic focusing on individualized exercise programs, including Pilates and clinical rehabilitation. Here, our unique and specialized teaching method is based on scientific principles that facilitate proper form and technique. We have incorporated this method into our wellness programs as a safe and effective exercise system to match your current fitness level and to meet your fitness and/or rehabilitation goals. As physical therapists, we evaluate each individual in order to design the most optimal and safest Pilates routine for each client. Our goal is to provide quality instruction with a focus on individual needs. Evolution Pilates offers general and specialized group classes. Alison Lichy, PT, DPT, NCS, was featured in Stroke Connection Magazine, in Spring of 2017, with her article called "Am I Losing Ground?". Read the article here. Jade Bender- Burnett, PT, DPT, NCS, was featured in Stroke Connection Magazine, in Spring of 2017, in an article called "Helping Others Understand: Post-Stroke Fatigue". Read the article here. 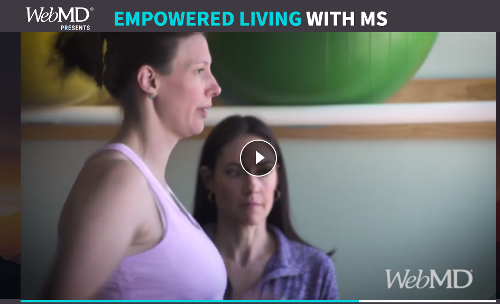 Our company and its treatment for Multiple Sclerosis was featured in a WebMD.com video, in 2017, called "Grow Stronger Together". Click the thumnbail below to view the video. Alison Lichy, PT, DPT, NCS, was recently featured in a Boston Globe article about robotics for patients following stroke. Read more about the article here. Our therapist was featured in CNN Money Magazine for saying "I have the best job in America!" Alison Lichy, PT, DPT, NCS talks about "Fatigue After Stroke" in Stroke Connection Magazine on the November/December 2010 issue. • Physical Therapy Recovery After Stoke • Does Physical Therapy Help People Recover from a Brain Injury? Automating activity-based interventions: The role of robotics. The association of race, cultural factors, and health-related quality of life in persons with spinal cord injury. Intensive electrical stimulation attenuates femoral bone loss in acute spinal cord injury. Hand spring operated movement enhancer (HandSOME) device for hand rehabilitation after stroke. Hand function recovery in chronic stroke with HEXORR robotic training: A case series. Feedforward control strategies of subjects with transracial amputation in planar reaching.